Alappuzha’s star granny and the oldest student in the district’s literacy mission, Karthyayini Amma, wrote her life’s first ever exam at 96, and scored full marks in her reading test. The exam was conducted on Sunday. Karthyayini Amma was calm and confident as she entered the exam hall in Cheppad’s Kanichenellur government Lower Primary School in Alappuzha, said Sathi, her teacher-coordinator.The nonagenarian was writing the 4th standard equivalency course under the Kerala Literacy Mission’s Aksharalaksham scheme. “There were 45 students who wrote the exam, and she was the oldest in the hall. The exam had three sections — 30 marks for reading, 40 for written Malayalam and 30 marks for maths. Amma scored full marks, 30 on 30, in the reading section. The results of the written exam have not yet been announced. However, Karthyayani Amma seems fairly confident about acing the written round as well, Sathi said. “She was unhappy that the question paper did not ask everything she studied. She feels she studied too much for no reason,” Sathi said. 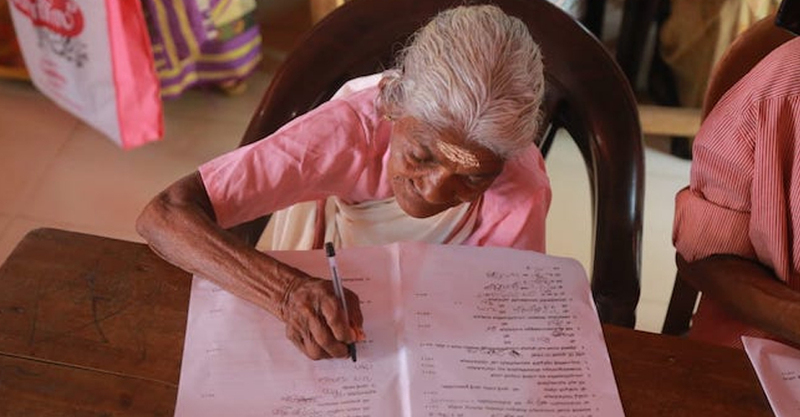 According to reports, over 45,000 senior citizens from across Kerala wrote the Literacy Mission’s test this year. Karthyayani Amma enrolled with the Literacy Mission in January this year. She will enter class four next year after qualifying the written test. The 96-year-old was tutored in Malayalam and math for over six months to take the exam. Lekha Raju, Karthyayini Amma teacher and next-door neighbour would come to Karthyayini Amma’s house to take classes. She would even revise her lessons with other neighbourhood grannies, who were also students. “She is now relaxing after her exam while trying to read an English book. The book was gifted to her by a Malayalam channel. She says she wants to practice her English before standard four begins,” Sathi adds.